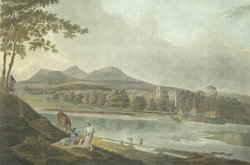 View of Dryburg Abbey and the Elden Hills by Charles Catton. Dryburg was the first Abbey to be built in Scotland and housed a community of Premonstratensian monks. The Abbey was established by Hugo de Morville in the early 12th century. Situated on a bend in the River Tweed the Abbey’s tranquil and secluded location was ideal for monastic life and the Abbey thrived until the middle of the 16th century when it was closed during the Reformation. The remains depicted in this print are all that survive of the large and ornate Abbey. The Abbey also houses the tombs of James Stuart, Sir Walter Scott and Field Marshall Earl Haig who were all buried here.